Dental bleaching or whitening is a popular procedure in cosmetic dentistry. It has effectively restored the smile of people with stained, dull, or discolored teeth. Be sure to have your teeth checked by our dentist before undergoing any type of whitening method. A child’s first teeth are generally sparkling white, thanks to their porcelain-like enamel surface, much whiter than the adult teeth that follow. Why? Teeth can become stained by bacterial pigments, food, fluoride and tobacco. Certain antibiotic medications (like tetracycline) can also cause teeth stains. Our tooth enamel is designed to protect the teeth from the effects of chewing, gnashing, trauma and acid attacks caused by sugar. 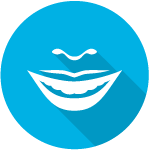 But over the years enamel is worn down, becoming more transparent and permitting the yellow color of dentin – the tooth’s core material – to show through. Age: There is a direct correlation between tooth color and age. Over the years, teeth darken as a result of wear and tear and stain accumulation. Grinding: Most frequently caused by stress, teeth grinding (gnashing or bruxism) can add to micro-cracking in the teeth and can cause the biting edges to darken. Significant color change in a short period of time is the major benefit of in-office whitening. This protocol involves the carefully controlled use of a relatively high-concentration peroxide gel, applied to the teeth by the dentist after the gums have been protected with a paint-on rubber dam. Generally, the peroxide remains on the teeth for several 15 to 20 minute intervals that add up to an hour (at most). Those with particularly stubborn staining may be advised to return for one or more additional bleaching sessions, or may be asked to continue with a home-use whitening system. In-office teeth whitening costs $650 per visit (on average) nationwide. Many dentists feel that professionally dispensed take-home whitening kits can produce the best results over the long haul. Take-home kits incorporate an easy-to-use lower-concentration peroxide gel that remains on the teeth for an hour or longer (sometimes overnight). The lower the peroxide percentage, the longer it may safely remain on the teeth. The gel is applied to the teeth using custom-made bleaching trays that resemble mouth guards. Take-home teeth whitening kit costs $100 to $400. 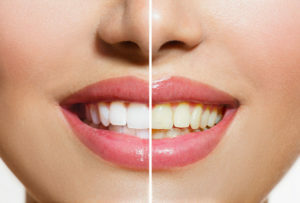 The cheapest and most convenient of the teeth whitening options, over-the-counter bleaching involves the use of a store-bought whitening kit. This option features a bleaching gel with a concentration lower than that of the professionally dispensed take-home whiteners. The gel is applied to the teeth via one-size-fits-all trays, whitening strips or paint-on applicators. In many cases this may only whiten a few of the front teeth unlike custom trays that can whiten the entire smile. Over-the-counter teeth whitening costs $20 to $100. For a brighter, whiter smile without the wait, opt for Opalescence Boost, an in-office, chemically activated whitening treatment that offers results in about an hour. Opalescence Boost features a unique, chemically activated formula that allows your dentist to whiten your teeth without the bothersome heat or ultraviolet rays of a light. Opalescence Boost also contains potassium nitrate and fluoride, which help to improve oral health by strengthening enamel, decreasing sensitivity, and offering increased cavity prevention. Opalescence Boost offers results in about an hour. The dentist-supervised, in-office procedure is safe and effective, and offers a brighter, whiter smile after just one appointment. The long and the short of it is that teeth whitening works. Virtually everyone who chooses this cosmetic treatment will see moderate to substantial improvement in the brightness and whiteness of their smile. However, teeth whitening is not a permanent solution and requires maintenance or “touch-ups” for a prolonged effect. We are pleased to offer you our teeth whitening services. Call us to make your appointment today.